Indianapolis, Minn. — (AP) - Guidant Corp. on Friday voluntarily recalled nearly 50,000 of its cardiac defibrillators implanted in patients worldwide because of potential malfunctions in the devices. Indianapolis-based Guidant said it was advising physicians about the safety of several defibrillator models, which have failed at least 45 times and have caused at least two deaths through May 30. The company has offered to replace some of the devices, but has not said that replacement of any is necessary. The recall includes about 38,000 devices used by patients in the United States. "This is a voluntary recall," U.S. Food and Drug Administration spokeswoman Julie Zawisza said. "We're in complete agreement that they need to do that." Guidant came under fire this spring after reports that it failed to alert physicians about potential problems with the Ventak Prizm 2 DR model defibrillator. Friday's recall includes the Prizm 2 DR, the Contak Renewal and Contak Renewal 2, the Ventak Prizm AVT, Vitality AVT, Renewal 3 AVT and Renewal 4 AVT ICDs. The company said about 63,000 of the devices had been implanted, with nearly 50,000 still in use. The devices are manufactured at Guidant's facility in Arden Hills, Minnesota. Guidant said patients implanted with those devices should continue to see their doctors at three-month intervals and any patient who recently received a defibrillator shock should consult with their physician. A Pennsylvania man sued Guidant on June 1, claiming the company is financially liable to all patients implanted with one of its heart defibrillators because it did not tell them the devices could short-circuit. The company said a programming change can be performed for the Prizm AVT, Vitality AVT and Renewal AVT devices at a physician's office to reduce the risk of a short circuit, while defective Prizm 2 DR and Contak Renewal devices will be replaced at no charge. "Patient safety is paramount and our highest priority," Guidant CEO Ronald W. Dollens said in a statement. "Guidant takes seriously its responsibility to create the most reliable products and services, enhance patient outcome and limit adverse events to patients." Implanted defibrillators shock the heart back into a normal rhythm when it starts beating irregularly. Earlier this month, Guidant stood by its decision to continue selling the Prizm 2 DR for months after a potential flaw prompted a redesign, saying the original device was still reliable. In April, the company told doctors that the Prizm 2 DR defibrillator had failed in a small number of cases because of an electrical flaw. It also said that it had fixed the flaw in devices made after mid-2002. No failures in the Prizm 2 DR has been reported since April 2002. 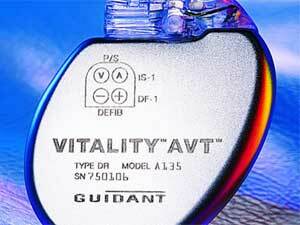 The faulty Contak Renewal defibrillators were manufactured on or before Aug. 26, 2004, Guidant said. A Pennsylvania man sued Guidant on June 1, claiming the company is financially liable to all patients implanted with one of its heart defibrillators because it did not tell them the devices could short-circuit. Lawyers for 74-year-old John Brennan said they hoped to make the legal complaint into a class-action lawsuit. Shares of Guidant fell 80 cents, or 1.1 percent, to $72.86 in afternoon trading on the New York Stock Exchange, where they have traded in a 52-week range of $49.95 to $75.15. Guidant shareholders in April voted overwhelmingly in favor of a planned $25.4 billion acquisition by Johnson & Johnson. The merger, which still must win regulatory approval in the United States and Europe, would be the largest business deal in the 119-year history of New Brunswick, N.J.-based health care products giant J&J. J&J has said it expects to complete the acquisition during the third quarter. Johnson & Johnson did not immediately return a message.